Whilst Edinburgh City Council is planning a transformation for cycling (and more) we hope you have had a cycling transformation already! So, for our 2018 summer competition, we’d like to know what has brought the biggest positive transformation in your cycling life in recent years. It might be some advice from a friend (or from Spokes! ), an improved cycle facility, buying a shopping bike-basket, seeing your child cycling to school every day, a new bike shed, a resurfaced road on your daily commute, joining a group such as Edinburgh Belles or All Ability Cycling – the possibilities are endless! Page 1 of entry form. See links below to download complete form. So, tell us what transformed your cycling life – you could win a great prize plus some modest fame – and maybe other people will benefit from your experience too! Note that if your entry refers to a place, it must be in Edinburgh or the Lothians. If you’ve been to Copenhagen or Amsterdam, that may have transformed your cycling life, but it won’t count for our competition! Your entry must fit an A4 sheet, but apart from that it’s up to you. Words alone are fine, even just one superb sentence, but pictures, a diagram, etc often add value. It’s easy to enter – but please carefully read our full entry form, downloadable below, which has the full rules on it. 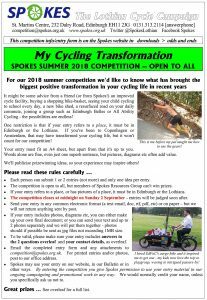 As with all our competitions, entries will appear on our website, anonymous except for prizewinners, to provide new ideas and get more people using bikes more often. Prizes include the great selection below. The top winner gets to choose their prize from the list, second chooses second, and so on. Even if you don’t win a prize… the next 10 runner-up entries will get to choose a free Spokes map. For detailed rules, prizes, how to send in your entry, and other information, download the entry form – here in Open Office [.odt], pdf and Word97 [.doc] formats. Please do read the rules carefully before entering. The competition closes on Sunday 2 September. Each person is allowed a maximum of 2 entries. Important – This is a locally-based competition. Your entry must be based in Edinburgh or the Lothians. Spokes may use some or all entries on our website, in our Bulletin, or in other ways – by entering the competition you agree to this. For example, in 2015 we produced a booklet of prizewinning favourite rides. Judging will be by Spokes Resources Group in September, assisted by an outside expert. For further fun and inspiration have a look at our competitions page which has the results of previous competitions, such as cycling jokes, cycling recipes, and how I’d spend £1m to get more people on bikes. Results of the 2018 competition will also appear on that page once the results are announced in September. Please help publicise our competition by retweeting our competition tweet, or if you compose your own tweet use hashtag #SpokesComp.